Mark Turner was drawn to the building industry by a childhood of playing and creating outdoors near his home in Jackson Hole, Wyo. Now in Falls Church, Va., Turner’s firm, GreenSpur, is in its 11th year of innovating in an industry often criticized for its stagnant habits and inflexibility. 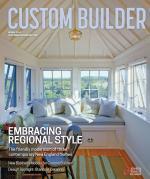 Turner spoke with Custom Builder about his firm’s unique funding model, his approach to green design, and the importance of storytelling. Q: What’s the story behind GreenSpur? A: I was working for a large developer running the construction in Washington, D.C. He was a wonderful developer, but the scale of the projects got so big that they lost all of the intimacy of the building craft. I left there on good terms to start something that would combine my Western ethos of ranch life and culture with sustainable and responsible projects. Q: Is there a typical GreenSpur project? A: We love anything that’s about half crazy or different. Our projects range from cabins in the middle of nowhere to large developments and micro housing to affordable housing to breweries and distilleries. We kind of run the gamut, but the common thread is that [the work is] unique. We’re having a lot of fun with this whole movement toward small and simple. I think it’s much harder to design a well-thought-out small space than it is a large home, and it’s more rewarding for us. I also think it hits a nerve—that people in general psychologically want that. Q: Who is your typical residential client? A: It’s mixed. The ironic thing is that Millennials (the largest segment of the marketplace) and Baby Boomers (the second largest) both crave similar product types. That is, downsizing, more experience-oriented, with less material grandeur. This allows us to have clients from young professionals to empty nesters and everyone in between. A: I would say we’re atypical. We come to the design from the builder’s side, so we’re more redneck, with sawdust on our pants, not skinny jeans and smart glasses. We like to work through the process pretty fast so we don’t get project fatigue. We do a lot of stuff with 3D models and 3D printing, and we spend a lot of time with clients early on trying to flesh out the story they want to tell. We like to have something that we can tether to historically, whether it be an old historical building or an old black-and-white photo. That gives the project an inflection point, which makes it easier for it to come about organically. Then, since we’re builders first and foremost, we marry the building science and cost with the design. We try to design toward a budget so that the project actually gets built. We also do a lot more design on the fly. We like to collaborate with the client, so shelving and built-ins and all that stuff organically comes from the space itself and less from the paper. Q: What does sustainable building mean to you? A: This is my own bandwagon, but I think we’ve fallen too in love with the LEED spreadsheet telling us what sustainability means, and we’ve forgotten about the love affair of what it actually means to build sustainably. At GreenSpur, it’s a relationship, and a healthy relationship has many facets. You should really love the project, it should stand the test of time, and other people should love it, too, so it provides an economic return on your investment. Does it last over time in terms of its materiality, and does it have an economic model to support it? It needs to for it to be sustainable. Q: How do you source sustainable materials? A: We follow a "three L” rule. First, we prefer to use local, whether it’s local barn siding or locally sourced material that was part of the natural historical façades or patina [of existing buildings]. That’s a nice stepping-off point. Second, it’s going to have to last. My pet peeve, as a builder, is seeing things you build that look good the first day for the photo shoot, but in two years’ time look run down. This means using materials that are going to last in the climate you’re building in. Finally, we want our clients to love the materials. Q: How do you focus on affordability while still being green? A: I don’t think sustainable should cost more. By definition, sustainable should be economically responsible, so if things cost five times more than the traditional, to me that doesn’t fit the category of sustainable. Frankly, I think one of the challenges in our industry is that we’ve overregulated our business, and that’s stopping innovation. The code book has gone from being 1 inch thick to 4 inches thick, and there hasn’t been a lot of major innovation in the last 50 years. We need to move more toward the software and tech world, where they have a lot more open-source solutions. That drives creativity and out-of-the-box thinking to solve problems. Right now, it’s expensive to build and it’s really hard to do affordable housing by the code, given land prices and zoning. It’s a tough problem to solve. Q: What are some solutions you’ve tried? A: We focus on a few things. First, we have a venture fund that decouples standard lending and eliminates some of the restrictions that lending puts on projects. Second, scale is a huge component of sustainability and making projects affordable. Building within the scale of what people really need and want is different from what the real estate appraisal will say you have to build. Finally, it’s the building science and how things get put together. There are a lot of different ways to make a home energy efficient that don’t require geothermal or solar and there’s a lot of low-hanging fruit you can incorporate that’s relatively inexpensive, insulation being the No. 1 thing. Q: How did you come up with the venture fund? A: I kept saying over and over again that our most fun and creative—and therefore most successful—projects were the ones that weren’t tethered to a traditional lending format. If you can decouple the traditional constraints from the design/build process, it really frees up the team’s creativity. It’s mainly friends and family and former clients who contribute, people who are into what we’re doing. There’s always some economic return, but they’re more interested in how they can fund something that has a good story and how they can be associated with that process. Q: How are you trying to disrupt the industry? A: One of the interesting things that’s happened in our industry is that some of the large home builders’ R&D budgets have shrunk to virtually zero. You’re seeing the same product type that’s worked in the past being replicated, and there haven’t been any giant steps forward. We really look at our firm as somewhat of an R&D firm. We’re crazy or stupid enough to try new things, and the risk is smaller at a smaller firm. What we try to do is not just build a great home to get LEED points or make it onto the cover of a magazine, but to figure out the story we’re trying to tell. If that’s done properly, it resonates with people. Q: Where do you get aesthetic inspiration? A: We’re really into some of the stuff coming out of the Scandinavian culture that is minimalist. It uses a lot of materials, like concrete and wood, that have a natural but very simple tone to them. Q: What about local vernacular? A: We use a ton of modern farm and modern barn vernacular. We tend to gravitate to that in projects because it’s local but also because the forms of barns and old farmhouses are so simple and utilitarian. Another element of sustainability is resourceful and timeless simplicity. Unfortunately, I think that’s recently been replaced by an almost overcooked modern, with no kind of foot in the historical past. Comments on: "Q + A: Fresh Philosophy"